Get ready to draw old skool with a reed pen and sepia ink! Using the expressive Vincent Van Gogh drawing as inspiration, find a subject that you consider to be “timeless” and draw it using sepia ink. How about that neighborhood landmark? Or that antique chair in the living room? Family heirlooms, or even your childhood toy would be great! 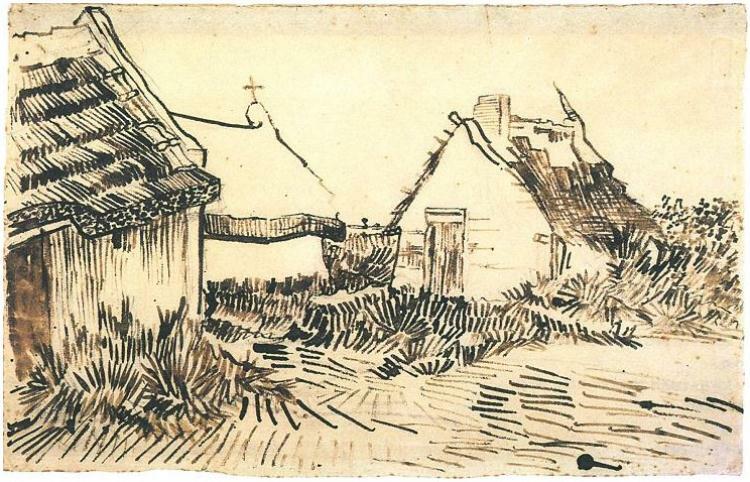 Once you’ve chosen your subject, slow down and get comfortable with the traditional technique of drawing in ink with a wooden stick or pen and scratching out a variety of different stroke marks like those made by Vincent. If you haven’t tried them, we suggest using walnut ink and a bamboo reed pen (see below) for this project. Walnut ink (ours is actually made from peat moss instead of walnuts) is named for the rich brown tones that it produces with every mark. But beware, it is not waterproof! Bamboo reed pens are carved from a piece of bamboo and are the forerunner to the classic dip pen with metal nib. If reed pens don’t appeal to you, try a stick from your backyard or a thin brush with your ink instead. This week, all of our Tom Norton Walnut Drawing Inks are 15% their regular price! We stock Tom Norton’s Walnut Drawing Ink because it is naturally derived, lightfast, made in small batches in the US, and creates beautiful subtle brown tones with each layer. Bamboo reed pens are available in 3 sizes: small, medium, and large. We also have a wide variety of dip pens and fine brushes that are sure to inspire! Categories: Wet Paint Weekly Workouts | Tags: art supplies, pen and ink, Reed pen, Tom Norton Walnut Ink, Vincent Van Gogh, Walnut Drawing Ink, Wet Paint St. Paul | Permalink.